Watching YouTube videos offline is not as difficult as it once was. Google announced two decisions about YouTube offline videos recently: YouTube Red and YouTube offline app in Africa, which both make it available to watch YouTube offline. Watch YouTube via YouTube Red: YouTube Red allows memberships to watch YouTube videos movies for offline ads-free, saving YouTube videos offline and enabling background play with a payment of $9.99 per month. It's undoubtedly an excellent ways to get YouTube Red movies or videos download for offline viewing if you do not mind the small drawbacks of this service: 1) YouTube videos can only be saved up to 30 days. 2) Not all YouTube videos are accessible for offline saving due to copyright protection. 3) YouTube Red service is only available in U.S. up till now. Watch YouTube Offline via YouTube Offline App: YouTube offline app download has been available in U.S. Europe etc. for free in the preceding years. And finally it was accessible for Africa months ago. Both iOS and Android phones and tablets support YouTube apps to watch YouTube videos offline. After the YouTube videos have been saved to a device, they are viewable for 48 hours. But before you get too excited and rush off to download your favorite YouTube videos, Google also announced that not all videos will be made available for offline viewing. Music videos, for instance, are excluded. As we can see, since the limitations of both YouTube Red and YouTube offline app for YouTube offline watching, a more comprehensive way - download YouTube videos offline with YouTube offline downloaders like MacX YouTube Downloader, would breach the limitations. MacX YouTube Downloader is a totally free video downloader for you to download YouTube videos offline on Mac with fast speed. It supports free downloading YouTube videos of different resolutions and formats, no matter common YouTube videos in MP4, FLV, WebM or HD videos in 4K/8K UHD, 1080P, 720P. There is no restriction of time and place for MacX YouTube Downloader. That is to say YouTube videos saved in this way can be watched offline without ads and buffering anywhere and downloaded once and forever. Besides, not only YouTube videos, but videos from Facebook, Vevo, Vimeo, Dailymotion, Metacafe and many more 300 sites can be downloaded and saved via this awesome video downloader. Step 1: Free download the awesome YouTube downloader and launch it on your computer. Click "Add YouTube URL" button to enter the downloading interface. And click "paste & analyze" button to add the video URL copied from YouTube. Step 2: Choose the output format(MP4, FLV, WebM etc.) resolution(720P, 1080P, 4K/8K) and video size from the automatically popped-up video details window. If you wanna to get YouTube offline viewing on iPhone iPad Android devices, Android iPad iPhone supported format, for example, MP4 is good choice. Step 3: Select the output folder destination to save the offline YouTube video. Step 4: Press "Download Now" to start downloading YouTube video to watch YouTube on TV, computer, smartphone, tablets, etc. offline. Obviously, different YouTube offline downloading methods apply different situations. If you lived in U.S., YouTube Red comes first for its convenience of ads-free offline playback and access of Google Play music for free and so on. If you intend to watch YouTube offline for instant in YouTube offline app covered area, YouTube offline app is the best choice of course. Whereas what if something apart from these two cases? MacX YouTube Downloader seems much more appropriate to watch YouTube offline anywhere and anytime. Mobile Devices: No matter what methods you take to download YouTube videos, watching YouTube offline on mobile devices is of course available as long as it's in iPhone iPad Android supported formats. Moreover, the YouTube Red benefits are available on the YouTube mobile apps for iOS and Android. Update to the latest version of the app (10.41 for iOS and 10.40 for Android) to make sure you have access to all YouTube Red member benefits. Mac/PC: Similar to mobile devices, as long as your YouTube video format is compatible to the Media Player on your computer, you can effortlessly watch YouTube offline on you Mac or PC. Usually VLC, Quicktime Player, 5KPlayer, Windows Media Player are common used for YouTube offline viewing on computers. TV-connected Devices: YouTube offline videos saved by apps and YouTube offline downloaders can be viewed in any smart TVs only if the videos are compatible to the TV. But if you saved YouTube offline with YouTube Red, you can watch ad-free videos on your TV with the following devices: Chromecast, Android TV, Apple TV, Roku and Game consoles like Xbox 360 and other supported smart TVs. People choose different devices to watch YouTube videos offline for various reasons, mobile devices on the go, smart TVs for sharper and crisp image, Mac/PC normally and so on. But not all the devices are compatible to YouTube offline videos. 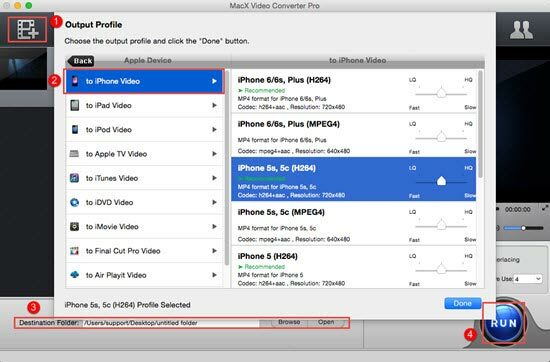 In other words, if your iPhone, Mac or TV does not support the YouTube video playback, you need to convert YouTube videos to their supported formats like MP4, MOV, WebM etc. with MacX Video Converter Pro, the advanced edition of MacX YouTube Downloader. Step 1: Free download the YouTube video converter and launch it. Import videos by clicking "Add Files" button. Step 2: Choose output format, or directly the specific device to watch YouTube offline from the popped-up window. For example, click "Apple Device" > "to iPhone Video" > "iPhone 6s", to finally convert the video to iPhone 6s/6s plus, iPad Pro, Samsung Galaxy S6 Edge+. Step 3: Click "Browse" button to specify the output folder path, saving the converted YouTube video where you like. Step 4: Press "RUN" button to finally download the YouTube video offline to iPhone iPad devices.